Talks on ending a deadlock between Greece and its international creditors broke up in failure on Sunday, with European leaders venting their frustration as Athens stumbled closer toward a debt default that threatens its future in the euro. European Union officials blamed the collapse on Athens, saying it had failed to offer anything new to secure the funding it needs to repay 1.6 billion euros ($1.8 billion) to the International Monetary Fund by the end of this month. Greece retorted it was still ready to talk, but that EU and IMF officials had said they were not authorized to negotiate further. Athens insists it will never give in to demands for more pension and wage cuts. "This is very disappointing and sad. It was a last attempt to bridge our differences but the gap is too large. One can discuss a gap, but this is an ocean," said a person who was close to the talks. Both sides acknowledged the talks had lasted less than an hour, although even here accounts differed: Greece put the length at 45 minutes, EU officials at half an hour. Following what it called this "last attempt" at a solution, the EU's executive Commission said euro zone finance ministers would now tackle the issue when they meet on Thursday. With no technical deal apparently possible, the ministers are likely to have to make difficult political decisions on Greece's membership of the currency bloc. Failure to keep Greece in the euro, after years of arduous negotiations and two emergency bailouts totaling 240 billion euros, would send it lurching into the unknown and mark a historic blow to the EU's most ambitious project. Last Friday, Greek Prime Minister Alexis Tsipras had indicated he would accept painful compromises on demands for austerity and reform in return for debt relief. But the Commission said after the talks, which also involved the European Central Bank, that "the Greek proposals remain incomplete". "While some progress was made, the talks did not succeed as there remains a significant gap between the plans of the Greek authorities and the joint requirements of Commission, ECB and IMF," it said. These amounted to up to 2 billion euros a year in permanent budget savings. EU officials said Athens had moved closer to the lenders on the size of Greece's primary surplus - the budget balance before its debt repayments - but had not said how it intended to achieve this. Otherwise the Greek delegation, led by Deputy Prime Minister Yannis Dragasakis, had offered nothing new, they added. Dragasakis said the Greek delegation remained ready to resume talks but blamed European lenders for insisting on pension cuts and value-added tax hikes to close the projected budget gap. European leaders have piled pressure on Tsipras to offer major concessions in the search for a deal with the EU and IMF as the country faces a debt default in just over two weeks. The talks' failure followed signs of an increasingly confrontational line by Greece's European Union partners. The toughest language came not from Greece's long-standing conservative critics but from German Social Democrat chief Sigmar Gabriel, who until recently had been regarded as sympathetic, at least by Berlin standards. He wrote in Bild newspaper that he wanted to keep Greece in the euro. "But not only is time running out but so too is patience across Europe. Everywhere in Europe, the sentiment is growing that enough is enough," said Gabriel, who is vice-chancellor in Angela Merkel's grand coalition government. "The shadow of an exit of Greece from the euro zone takes on ever clearer shape," he said. "Repeated apparently final attempts to reach a deal are starting to make the whole process look ridiculous. There is an ever greater number of people who feel as if the Greek government is giving them the run-around." Germany's Frankfurter Allgemeine Sonntagszeitung reported European Commission President Jean-Claude Juncker, also reputed to have been more sympathetic to Greek views, warned Tsipras about the risk of "Grexit" - a Greek exit from the euro - when they met last week. Tsipras says imposing yet more austerity on a country whose economy has shrunk by a quarter in recent years is futile, and will only deepen the suffering of Greeks whose living standards have already dived while unemployment soared. U.S.-based economic analyst Jacob Funk Kirkegaard cast doubt on the Athens government's longevity. He said Europe seemed to be giving up on trying to coax Tsipras toward the political center, opting for confrontation that might lead to "a new more realistic government". "It is increasingly obvious he is not even a closet centrist but largely seems to agree with the left wing of his party. The euro area thus has no real choice but to seek regime change in Athens," he said on the website of the Peterson Institute for International Economics. Tsipras still seems to have some support in his quest for debt relief. A person familiar with the negotiations told Reuters that discussions were under way on the issue. Athens faces immediate problems in repaying debts as the EU and IMF have not paid any money from Greece's bailout programs since the middle of last year. On top of the IMF loan, it must also repay 6.7 billion euros when Greek bonds held by the ECB fall due in July and August. Even if this short-term hump can be overcome, Greece still faces the daunting prospect of eventually repaying the bailout loans, something that will hang over its enfeebled economy for decades unless a relief deal is achieved. Germany's EU commissioner said on Monday it was time to prepare for a "state of emergency" after talks collapsed at the weekend to rescue Greece from default and ejection from the euro. Prime Minister Alexis Tsipras ignored a litany of pleas from European leaders to act fast and instead blamed creditors for the collapse in aid-for-austerity talks, the biggest setback yet in long-running talks to secure more aid for Greece. Athens now has just two weeks to find a way out of the impasse before it faces a 1.6 billion euro bill due to the International Monetary Fund, potentially leaving it out of cash, unable to borrow and cast out of the single currency. While there was little sign of open panic in Athens as Greeks held out hope for a last-minute solution - a familiar theme over the past six years as Athens lurched from one crisis to the next - the latest impasse triggered a selloff in European and Asian shares and weighed on the euro. Greek stocks fell 6 percent, while banking stocks tumbled as much as 12 percent. Greek two-year government bond yields surged more than 3 percentage points to 29.02 percent. "We should work out an emergency plan because Greece would fall into a state of emergency," Germany's EU commissioner Guenther Oettinger said. "Energy supplies, pay for police officials, medical supplies, and pharmaceutical products and much more" needed to be ensured. But in Athens, Tsipras - the 40-year-old novice radical leftist leader elected on a pledge to end austerity - betrayed few signs of alarm. Ignoring warnings from European policymakers that it was up to Athens to act now, Tsipras coolly said he was happy to wait it out till the lenders changed their minds. "We will await patiently until the institutions accede to realism," Tsipras said in a statement to Greek newspaper Efimerida ton Syntakton. "We do not have the right to bury European democracy at the place where it was born." He blamed "political expediency" on the part of lenders and their insistence on new cuts in pensions "after five years of looting under the bailouts" for the latest impasse. Tsipras will meet his negotiating team later on Monday as his government plots its next move before a make-or-break meeting of euro zone finance ministers on Thursday to discuss Greece's fate and make a final attempt to bridge differences. Athens has balked at demands to raise taxes and cut pensions to narrow a projected budget gap and laid the blame squarely on European and IMF creditors for insisting on politically unpalatable pension cuts. It says years of cuts have only made its situation worse by shrinking the economy, making it harder to pay off debt. Greece's creditors argue the country must reform its pensions system if it is to put government finances on a sustainable footing. They say many Greek workers retire younger than in other European countries, collecting pensions that require unaffordable government subsidies. "Why insist on pensions? Pensions and wages account for about 75 percent of primary spending; the other 25 percent have already been cut to the bone," IMF chief economist Olivier Blanchard wrote in a blog post. "Just as there is a limit to what Greece can do, there is a limit to how much financing and debt relief official creditors are willing and realistically able to provide given that they have their own taxpayers to consider." The prospect of snap elections or a referendum to allow Tsipras a face-saving way out of the crisis returned as an option in popular debate in Greece, as the leftist leader faced calls from the opposition to secure a deal to protect the country from an economic collapse. Although many economists predict that, as in past crises, a way will be found to avert default, European politicians sound more determined than ever to resist compromising with demands they consider unreasonable. Belgian Finance Minister Johan Van Overtveldt said in Berlin that the euro zone's credibility would be damaged if agreements with Greece were changed, and radical forces in other countries would be emboldened. Jens Weidmann, the head of Germany's central bank, said: "Time is running out for Greece. The willingness to do a deal and act is lacking." Greece's Finance Minister Yanis Varoufakis retorted in an interview with Germany's Bild newspaper that it was possible to reach a deal quickly if Chancellor Angela Merkel took part in the talks. "I rule out a 'Grexit' as a sensible solution," Varoufakis said, referring to a possible Greek exit from the euro zone. "But no one can rule out everything. I can't even rule out a comet hitting Earth." After weeks of minor ebbs and flows on the stop-start negotiations, bond markets across the euro zone signaled alarm that a deal may not be reached by mid-year, when Athens must repay 1.6 billion euros ($1.8 billion) to the International Monetary Fund. The premium investors demand to hold Spanish, Italian and Portuguese government bonds over low-risk German Bunds hit 2015 highs, with the 10-year yield gap between Spanish and German debt touching its widest since August. Shares in Europe and Asia fell, led lower by banks. The euro weakened against the dollar, pressured also by investor anxiety ahead of a U.S. Federal Reserve interest rate-setting meeting later this week. U.S. stock index futures ESc1 were down 0.5 percent, suggesting Wall Street would extend Friday's declines, which were blamed on worries over Greece and the Fed meeting. This is why ECB president Mario Draghi is calling for a comprehensive deal now. The contagion effects we are witnessing are only the beginning, things will get much worse if Grexit happens, something Anatole Kaletsky didn't really think through in his simplistic and idiotic comment on a Greek suicide. So what is really going on in Greece? Basically more of the same except both sides are taking an extreme stance in the debt talks, waiting to see who will blink first. The demands of the creditors are ridiculous as they will sink Greece further into a debt deflation death spiral but Tsipras, Varoufakis and the rest of Syriza are lying when they say "we've done all we could to reform the Greek economy." Nobody is listening to the IMF's Olivier Blanchard who rightly notes a credible deal will require difficult decisions by all sides. When it comes to Greek suicide, I want you all to keep Stefanos Manos's observations in mind, not those of Anatole Kaletsky. There are more civil servants in Greece on a per capita basis than in Canada (1.5 million in Greece vs 3.6 million for Canada which has three times Greece's population). Worse still, the ratio of public sector workers to private sector workers is totally out of whack (1.5M in public sector vs 2.5M in private sector) and many businesses waiting to be paid by the Greek state are teetering on bankruptcy. And with those public sector jobs come defined-benefit pensions which are constitutionally protected for life, unless of course, the country defaults and real chaos ensues, not just for Greece, but for the eurozone and the world. Apart from its over-bloated and grossly inefficient public sector, Greece needs other reforms to modernize its economy, making it competitive and attractive to foreign investors. What stands between Greece and prosperity is not another labour reform or wage cuts to make the economy more ‘competitive’, nor further fiscal consolidation or a pension reform to instil confidence in investors. The real issues are deeper than that. In order to unlock the potential of Greece, its entrepreneurial skills and underused natural resources, Greece needs to improve the institutions that govern its economy. First, Greece needs to reform its public bureaucracy, which has been opaque, inefficient, and clientelistic for decades. Successive reform attempts have largely failed, and the Greek public bureaucracy remains subject to heavy political influence. Since the crisis, Greece has made some progress, for example in tackling corruption, but the momentum for change was fading even before Syriza came to power. The problem is that institutional reform cannot happen without broad support from Greek society, politicians and bureaucrats themselves – and even then it will not happen easily, and take time. Second, Greece needs decisive reform to its judicial system. A functioning legal system is at the heart of a market economy; it benefits entrepreneurs, investors, exporters, and lowers inequality. It currently takes 1,580 days to enforce a contract in Greece, according to the World Bank’s ’ease of doing business’ survey (the OECD average is 540 days). This places Greece 155th of 189 countries in the world, right alongside Chad, Pakistan and Italy. The broader rule of law index of the World Justice Project puts Greece at the bottom of high income countries, just above Russia. Justice reform usually takes a long time, and hence needs broad political and public support to be sustainable. Third, Greece needs to cut unnecessary regulation and state involvement in product markets. Regulation serves the purpose of making product markets work better and minimising legal costs, but can also enable incumbents to stifle competition. The regulated therefore have an incentive to influence policy-makers to tweak regulation in their favour. State control of the economy, while useful in some areas, needs to be limited for the same reason: price controls and state companies are potential breeding grounds for clientelism. Greece uses more product market restrictions and state control of the economy than other eurozone countries, according to the OECD, although it should be noted that it has made progress in recent years and is now where Germany was in the not-so-distant past (see Chart 2). The OECD has compiled a list of 329 recommendations to improve competition in various Greek sectors, and those recommendations are part of the current negotiations. However, such liberalisation could prove short-lived if not complemented by judicial and bureaucracy reform. Tackling these problems will take Greek ideas, Greek resolve, Greek perseverance – and not outside pressure. Support for reform will always be grudging if it is done at the barrel of a gun. Greek civil society and a broad coalition of political parties need to join forces and agree on a package to change these institutions sustainably, such that it is implemented regardless of the outcomes of future elections. The progress of the reform process should not be monitored by an outside actor, micromanaging Greek policies, but by a council consisting of Greek experts, Greek civil society and media, and the major political parties in parliament. Only with full ownership of the reform process can the institutions of the country be reformed. Nevertheless, Tsipras and Varoufakis remain undeterred, their strategy over the last five months is to play dumb and stall, waiting for creditors to blink as they keep collecting billions from the ECB in emergency liquidity assistance. This is all part of Varoufakis's great game that some are now openly criticizing. But as I explained in my comment, For Whom the Bell Tolls?, these games of brinkmanship have cost the Greek and eurozone economies. In fact, Bloomberg put out an article demonstrating Tsipras's brinksmanship in eight charts, showing how these games have cost the Greek economy dearly. Still, Tsipras doesn't care. He will keep pandering to powerful public-sector unions who elected his party to power and will keep rebuffing creditors at all cost. And therein lies the ultimate problem with this lose-lose game of brinkmanship, it puts everyone in an uncompromising and untenable position. The creditors have tightened up the big fat Greek squeeze to the point of absurdity, and Tsipras is calling their bluff, telling them to 'get real' with their demands. So here we are. 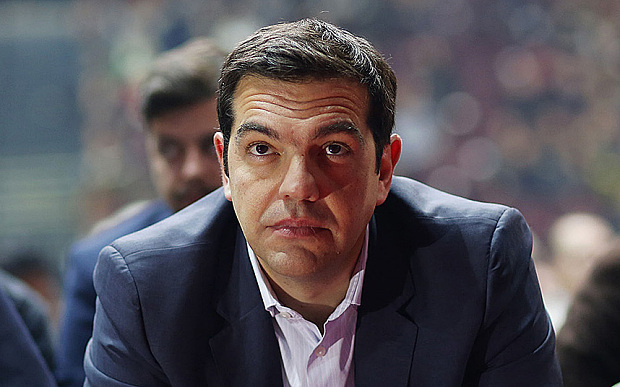 Alexis Tsipras has been told to take it or leave it. What should he do? The Greek prime minister does not face elections until January 2019. Any course of action he decides on now would have to bear fruit in three years or less. First, contrast the two extreme scenarios: accept the creditors’ final offer or leave the eurozone. By accepting the offer, he would have to agree to a fiscal adjustment of 1.7 per cent of gross domestic product within six months. My colleague Martin Sandbu calculated how an adjustment of such scale would affect the Greek growth rate. I have now extended that calculation to incorporate the entire four-year fiscal adjustment programme, as demanded by the creditors. Based on the same assumptions he makes about how fiscal policy and GDP interact, a two-way process, I come to a figure of a cumulative hit on the level of GDP of 12.6 per cent over four years. The Greek debt-to-GDP ratio would start approaching 200 per cent. My conclusion is that the acceptance of the troika’s programme would constitute a dual suicide — for the Greek economy, and for the political career of the Greek prime minister. Would the opposite extreme, Grexit, achieve a better outcome? You bet it would, for three reasons. The most important effect is for Greece to be able to get rid of lunatic fiscal adjustments. Greece would still need to run a small primary surplus, which may require a one-off adjustment, but this is it. Greece would default on all official creditors — the International Monetary Fund, the European Central Bank and the European Stability Mechanism, and on the bilateral loans from its European creditors. But it would service all private loans with the strategic objective to regain market access a few years later. The second reason is a reduction of risk. After Grexit, nobody would need to fear a currency redenomination risk. And the chance of an outright default would be much reduced, as Greece would already have defaulted on its official creditors and would be very keen to regain trust among private investors. The third reason is the impact on the economy’s external position. Unlike the small economies of northern Europe, Greece is a relatively closed economy. About three quarters of its GDP is domestic. Of the quarter that is not, most comes from tourism, which would benefit from devaluation. The total effect of devaluation would not be nearly as strong as it would be for an open economy such as Ireland, but it would be beneficial nonetheless. Of the three effects, the first is the most important in the short term, while the second and third will dominate in the long run . Grexit, of course, has pitfalls, mostly in the very short term. A sudden introduction of a new currency would be chaotic. The government might have to impose capital controls and close the borders. Those year-one losses would be substantial, but after the chaos subsides the economy would quickly recover. Comparing those two scenarios reminds me of Sir Winston Churchill’s remark that drunkenness, unlike ugliness, is a quality that wears off. The first scenario is simply ugly, and will always remain so. The second gives you a hangover followed by certain sobriety. So if this were the choice, the Greeks would have a rational reason to prefer Grexit. This will, however, not be the choice to be taken this week. The choice is between accepting or rejecting the creditors’ offer. Grexit is a potential, but not certain, consequence of the latter. If Mr Tsipras were to reject the offer and miss the latest deadline — the June 18 meeting of eurozone finance ministers — he would end up defaulting on debt repayments due in July and August. At that point Greece would still be in the eurozone and would only be forced to leave if the ECB were to reduce the flow of liquidity to Greek banks below a tolerable limit. That may happen, but it is not a foregone conclusion. The eurozone creditors may well decide that it is in their own interest to talk about debt relief for Greece at that point. Just consider their position. If Greece were to default on all of its official-sector debt, France and Germany alone would stand to lose some €160bn. Angela Merkel and François Hollande would go down as the biggest financial losers in history. The creditors are rejecting any talks about debt relief now, but that may be different once Greece starts to default. If they negotiate, everybody would benefit. Greece would stay in the eurozone, since the fiscal adjustment to service a lower burden of debt would be more tolerable. The creditors would be able to recoup some of their otherwise certain losses. The bottom line is that Greece cannot really lose by rejecting this week’s offer. Münchau makes a good point but as a friend of mine wrote to me in an email, "Greece is not independent and requires foreign exchange to import basic goods for its citizens. A return to the drachma would result in significant hyperinflation and basically eliminate any of the middle and upper middle class left in the country." In other words, if Greeks think austerity is terrible under the Troika, wait till they see what a return to the drachma will do to their economy. It will be the current austerity to the power of ten! Of course, Münchau is right, Germany and France stand to lose the most from Grexit and so do other countries as contagion spreads, putting pressure on their bond yields. Worse still, if contagion spreads, triggering a liquidity time bomb, the entire global financial system and economy will be at risk. This is why I believe someone will blink, and it won't be Tsipras. Creditors will bite the very bitter bullet and partially cave to additional debt relief. If they don't, they'll be risking a lot worse than Grexit, and I just can't see this happening (still, never say never!). It will be checkmate by not for Greece but this will be a Pyrrhic victory. In the long run, as Greece keeps putting off major reforms to its economy, like cutting its public sector down to an appropriate size, it will only sink further into the abyss. And far from being heroes, Tsipras, Varoufakis, Dragasakis and the rest of Syriza will go down in history as the worst politicians Greece has ever known. I'm convinced of this. But I'm equally critical of the leaders of eurozone and IMF as they failed miserably to address the underlying structural problems plaguing this union. By imposing increasingly dumber and insane austerity measures on the Greeks, they showed the world just how inept and clueless they are when it comes to dealing with a sovereign debt crisis. This is why while I empathize with creditors, I don't feel particularly bad for them either. They poured gas over the Greek fire and will get badly burned. Below, former Greek Prime Minister, George Papandreou, who led the country from 2009- 2011 and oversaw Greece's first request for an international bailout in 2010, told CNBC that the situation was a mess and that Greece is on the 'brink' of disaster. Of course, what Papandreou failed to mention is that his father and successive Greek leaders over the last forty years, including him, are all responsible for this mess as their statist policies kept expanding the Greek public sector into the monstrosity it has become, and that is what has ultimately destroyed Greece.